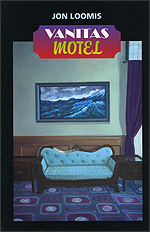 Things happen in Vanitas Motel: a funeral, a fistfight, an outburst at a poetry reading. Its poems are surreal parables, at once funny and dark, sensual and deeply serious. Their revealed subjects are loss, art, illness, and desire. "Jon Loomis's grave, intelligent, mysterious poetry takes you under your own skin, into your own soul, 'only visible in / silhouette dark / planet circling its small / red sun.'" Jon Loomis is also the author of The Pleasure Principle. wake up--my heart flops and flops in its creel. dogs in the valley, dogs downtown. barks at once. The planet skips from its orbit. The dead rise, groaning, from their humid beds. Copyright c 1998 by Oberlin College. May not be reproduced without permission.